This course is specially written to be easy to follow and motivating to use; it does not assume any existing knowledge of foreign languages or language concepts. It is equally suitable for those starting to learn Esperanto from scratch or for those wanting to deepen and consolidate knowledge learnt via the Free Taster Course. "Elementary,..!" is based on an intriguing spy story, and its lessons cover basic grammar and vocabulary to give you a good working knowledge of Esperanto, for writing letters, reading articles, and chatting to other Esperantists. The course includes listening tasks and an opportunity to converse with your tutor on the phone to practise speaking and correct pronunciation. All our courses include support from a tutor, who will monitor your progress by checking answers, highlighting and explaining any areas that you may have misunderstood, and answer any questions or queries that you may have as you learn the language. You can correspond with your tutor by post or by e-mail. A reading text (48 pages), Gerda malaperis!, by the internationally renowned author, Claude Piron. This story is written in simple but elegant language which introduces a carefully-chosen selection of new words with each chapter; these words then occur again in later chapters so that you become familiar with them. A lessons book (228 pages), containing 25 lessons to accompany the chapters in the reading text, with world-lists, detailed explanations and self-help exercises of the grammatical points, tutor-marked exercises, and puzzles. 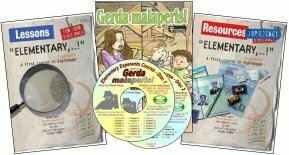 A resources book (131 pages), containing a two-way dictionary of the words used in the course, a summary of grammatical terms, answers to the self-help exercises and puzzles, and insights into the "world of Esperanto". Two audio CDs (139 minutes) with a reading of the story performed by an international cast, listening exercises, and pronunciation hints. [see Elementary..! course price and order online]. A second reading text Lasu Min Paroli Plu! which is a collection of short stories, also by Claude Piron. Each chapter parallels a chapter of the course's story text Gerda malaperis! and cunningly re-uses in an interesting and entertaining way the words and grammar introduced thus far. What better way to practise newly acquired skills? [see price and order online]. Students who have paid for the "Elementary,..!" course can also access the course's materials and some of the optional components online, e.g. to download the texts into an e-reader, and/or to download the audio files into an MP3/music player. The "Elementary,..!" online site with its (password-protected) downloads is: https://legacy.esperanto.org.uk/eldonoj/elementary/index.htm. Potential Canadian students seeking tutorial support should contact Kim Keeble. Copyright © 2014, EAB Esperanto Education.